Hi, I am interested in your 1966 Shelby Cobra (stock #1335-NSH) listed on Autotrader for $37,995. I'd like to get more information about this vehicle and confirm its availability. 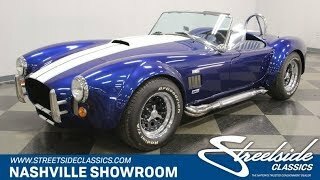 The Shelby Cobra is a legendary performance car for some obvious reasons. As Carrol Shelby put it, Its a massive motor in a tiny lightweight car . It is no wonder that they have been recreated so often as both awesome looking and fun to drive road cars. Come on down and check out what its like to be sitting behind the wheel of one of these American classics. It is hard not to notice this car whether its sitting still or rolling down the street. It is small, but pretty obviously packs some punch with the pumped up looks of the bulging fenders filled up with some serious rubber. This car looks sharp in a shade of Blue like the originals along with the twin White racing stripes that run from the very bottom of the bodywork in the front to the very bottom in the rear. Up front, big air intakes provide lots of cooling for the beast of an engine within. There is a Shelby Cobra badge front and center and of course a hood scoop. Bumper uprights as well as the headlight trim rings are dressed in chrome. Powered by Ford and 427 Cobra badges appear above and below the air extraction vents in the front fenders. Chrome side pipes are always awesome and really get peoples attention. Theres a chrome three-point roll bar and the curves all flow back together nicely at the rear of the car. Open the door and you will find a nicely trimmed Blue interior that might qualify as a luxury package on these cars. That is because the originals were extremely spartan. Instead of a simple aluminum skin, this one has a fully trimmed out door panel with a wood trimmed pull and a handy pocket to stash things in as well as a full carpet set dressing out the interior. A wooden steering wheel is mounted on a three spoke hub with a GT center button. The speedo sits off to the left with the tach on the right and there are four engine monitoring gauges for water temp, oil pressure, voltage and fuel in the top center. Below them are control switches and below that an FM/Cassette stereo. The bucket seats are both comfortable with nice pleated seating surfaces and supportive with substantial side bolster to keep you in place during spirited driving. Of course, the racing harnesses provide an extra measure of safety as well as looking cool and the shifter for the manual transmission falls easily to hand. Under the hood you will find a 427 cubic inch small block powerhouse nestled down in a neat and clean engine bay. There is a polished K&N air topper sitting on an Edelbrock 4-barrel carburetor and intake manifold. Polished valve covers add a splash of flash and the red spark plug wires are neatly loomed to provide good hot spark to the plugs. Headers are wrapped with heat tape as they flow down and then out to those awesome side pipes that make this car sound awesome. Power flows back through a 4-speed manual transmission to a solid rear axle located with trailing arm and coil springs. Up front, a control arm suspension and coils springs work with rack and pinion steering for precise handling and front disc brakes provide great stopping power. The rubber meets the road through 255/60R15s in the back and 245/60R15s in the front mounted on black and polished wheels with spinner center caps. These are awesome looking and fun to drive cars that attract plenty of attention anywhere they go. Come on down and get an up-close look at this car. And we dare you not to smile when you hear those side pipes.